Enjoy your morning coffee or evening cocktail in peaceful bliss on an expansive deck, the dock or a sunset deck. 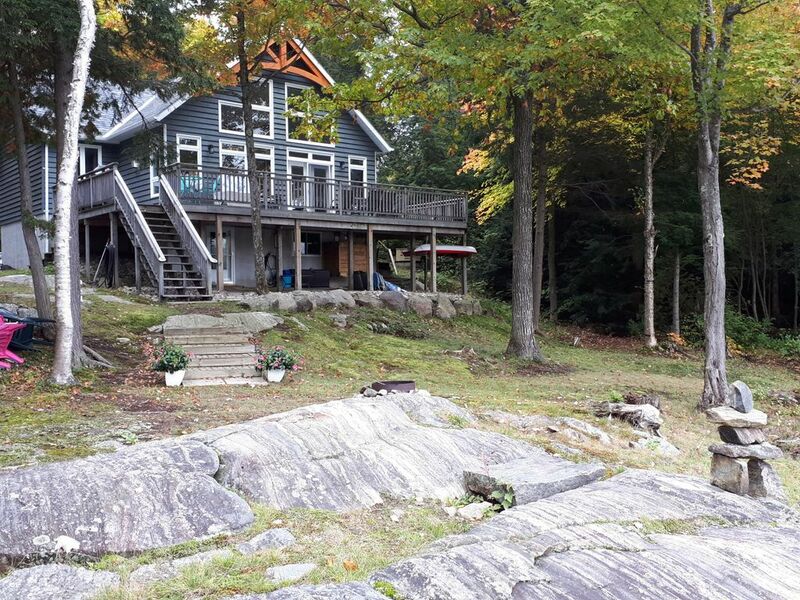 The best of both worlds - private surroundings on 4 acres of beautiful forest within walking distance of Bala. Cottage life with all the conveniences, including municipal water and an automatic generator. Over 330 feet of waterfront on Moon River. With kilometres of beautiful waters and Bala Falls minutes away, you can fish, boat, ski or paddle for hours. Sleeps eight - perfect for families. Please submit a Traveller Profile prior to finalizing a Booking Request or send the owner a message. Newly renovated with fabulous open concept. Gourmet kitchen featuring black walnut live-edge island top, quartz countertops, stainless steel appliances and wine fridge. A cook's delight. Perfect for entertaining. The island easily accommodates eight people. The kitchen opens into a family room with 16-foot ceilings, new floor-to-ceiling fireplace and outstanding views from a wall of floor-to-ceiling windows. Bright and airy family room - great for entertaining with new furnishings. Great for families - lots of room to play and explore. Play horseshoes, go for a bike ride (2 bicycles available), kayak for hours (2 kayaks available), a hike, an ice cream or a treat at Don's Bakery. Gentle, shallow water entry. 5 minute drive or 20 minute walk to town of Bala; public boat launch less than 5 min away; close to Gravenhurst or Port Carling; 1 3/4 hr north of Toronto. So close to town you can walk to the fresh market during the summer months, grab a coffee and a sweet treat at Don's Bakery, or pop into the historic Bala Museum with Memories of Lucy Maud Montgomery (author of Anne of Green Gables). Enjoy the Bala Cranberry Festival in the Fall and you can walk to all the activities - yet it's so private you'd never know this is all at your doorstep. Looking for evening fun? Check out an act at the Kee to Bala. This cottage is simply beautiful. Peter was there to greet us and he had to pick our jaws up off the floor. Completely renovated, all appliances are top notch, kitchen is totally equipped, beds & pillows are so comfortable. Gail and Peter have done a phenomenal job and have thought of everything. They provided wood for the fire and kayaks for the river. Lots of seating on the large deck, two barbecues and bikes. It is very private but is just a short walk to downtown Bala - make sure you go to Don's Bakery! Our family of six adults and a nine month old really enjoyed our stay here.